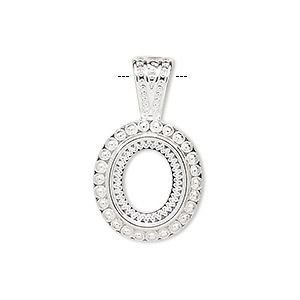 Pendant, silver-plated brass, 10x8mm fancy oval cabochon setting. Sold per pkg of 4. 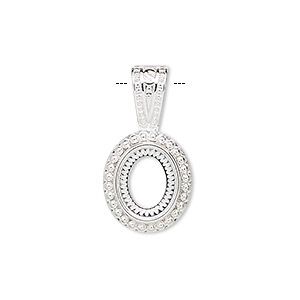 Item Number: H20-8794FN Have a question about this item? 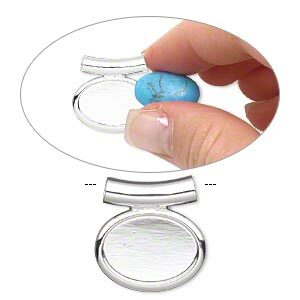 Glue-in style to easily set cabochons for pendants. Beautiful design options at friendly, economical prices. Cast in brass; heavily plated. 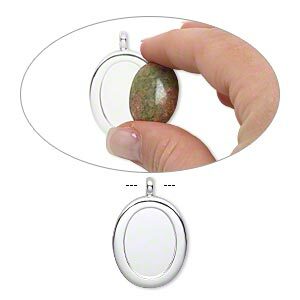 Pendant, silver-plated brass, 18x13mm oval rope design cabochon setting. Sold per pkg of 4. 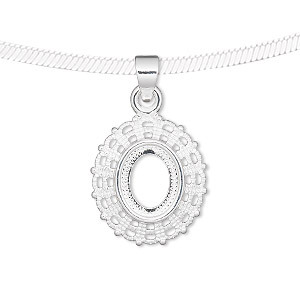 Pendant, silver-plated "pewter" (zinc-based alloy), 24.5x13mm oval with rope design and 10x8mm oval setting. Sold per pkg of 4. 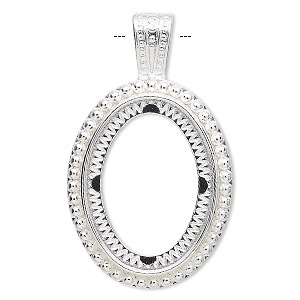 Pendant, silver-plated "pewter" (zinc-based alloy), 43x24mm oval with rope design and 25x18mm oval setting. Sold per pkg of 4. 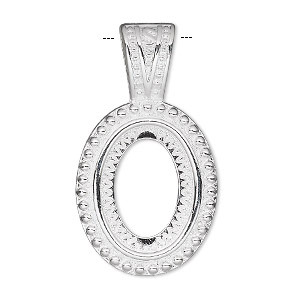 Pendant, silver-plated "pewter" (zinc-based alloy), 30.5x16.5mm oval with rope design and 14x10mm oval setting. Sold per pkg of 4. 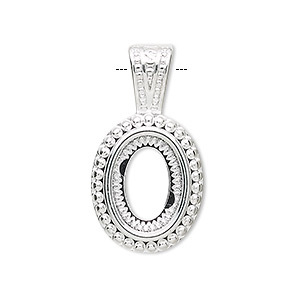 Pendant, silver-plated "pewter" (zinc-based alloy), 27x16mm oval with rope design and 12x10mm oval setting. Sold per pkg of 4. Pendant, silver-plated "pewter" (zinc-based alloy), 30x27mm single-sided fancy oval with 25x18mm oval setting and tube bail. Sold individually. 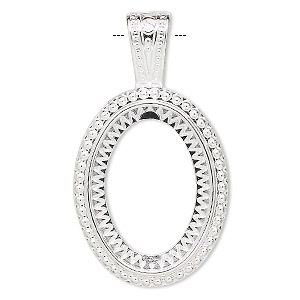 Pendant, silver-plated "pewter" (zinc-based alloy), 49x29.5mm oval with rope design and 30x22mm oval setting. Sold per pkg of 2. Pendant, silver-plated "pewter" (zinc-based alloy), 22x21mm single-sided fancy oval with 18x13mm oval setting and tube bail. Sold individually. 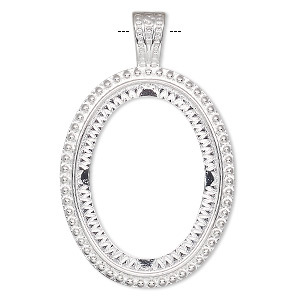 Pendant, silver-plated "pewter" (zinc-based alloy), 59x37.5mm oval with rope design and 40x30mm oval setting. Sold per pkg of 2. 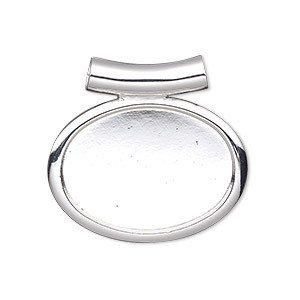 Pendant, silver-plated "pewter" (zinc-based alloy), 40x27mm single-sided oval with 25x18mm oval setting and tube bail. Sold individually.